The Lenovo K8 Plus has just been launched in India. The device is powered by 2.6Ghz MediaTek Helio P25 Octa-Core processor with 3GB of RAM and 32GB of internal storage. The phone runs on stock Android 7.1.1 Nougat, and sports a 5.2-inch Full HD 1080p IPS display with 424 PPI, 450 NITs brightness and 178° viewing angles. The display has an oleophobic coating to prevent smudges, and is protected by Corning Gorilla Glass. The camera department on the Lenovo K8 Plus comprises of dual rear cameras with dual ISP Imagiq. The primary lens is a 13 megapixels Purecel Plus Sensor for RGB, and a 5 megapixels depth sensor from Samsung. The camera has an f/2.0 aperture with largan precision 5-element lens, and supports pro mode and depth mode for bokeh effects. The selfie lens on the K8 Plus is an 8 megapixels camera, with an 84° wide-angle lens, with an f/2.0 aperture five element lens. The K8 Plus has a fingerprint scanner on the back panel. The phone packs in a 4000mAh battery, and has a dedicated music key which can be customized according to your app needs. In terms of audio, the K8 Plus supports Dolby Atmos and offers TheaterMax for VR. Connectivity options on the device includes support for 4G LTE with VoLTE, Dual SIM Cards, WiFi. The phone has a dedicated microSD card slot and also supports USB OTG. The Lenovo K8 Plus will be available in Venom Black and Fine Gold colours. 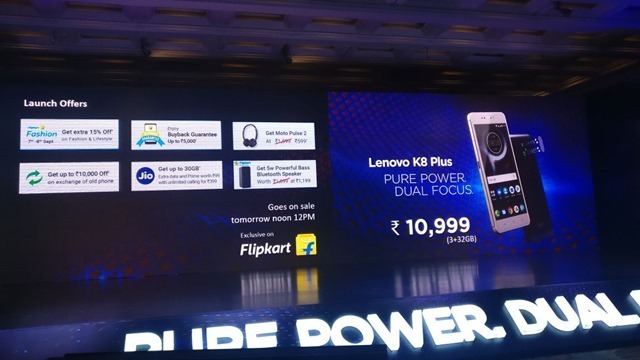 The Lenovo K8 Plus has been priced at Rs.10.999 and will be sold exclusively on Flipkart, from September 7th with some launch offers. You can get an extra 15% off on fashion and lifestyle products on the store, a buy back guarantee of Rs. 5,000, a Moto Pulse 2 headset for Rs. 599, up to 30GB of Jio Data, a 5w Powerful Bass Bluetooth Speaker for Rs. 1,199. You can exchange your old phone for up to Rs. 10,000 off the price on the K8 Plus's price tag.